Put the egg yolks in a small, heavy pan with the zest and lemon juice. Heat gently, stirrng constantly till it thickens to a custard consistency. This won’t take long; don’t overheat, or it will curdle. Remove from the heat and stir in the honey and olive oil. Put in the fridge to chill. You can do this part in advance, even the day before. No more than an hour before you want to serve the mousse, whisk the egg whites till stiff, then add the sugar and whisk till shiny and standing in stiff peaks. 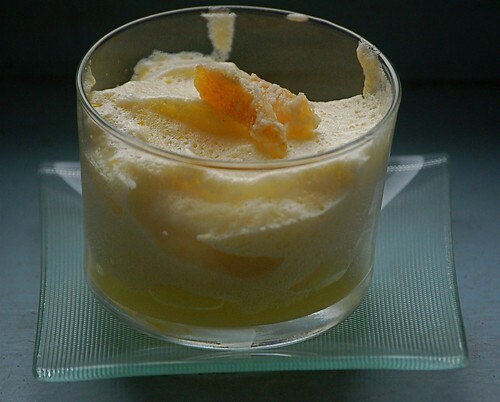 Fold into the custard mixture, spoon into 4 pretty glasses, and return to the fridge till ready to eat. Garnish with toasted almonds, candied lemon peel, or even a drizzle of olive oil. You could serve this with thin, crisp biscuits, but it’s not really necessary. IT had collapsed a bit when I took the photo 🙂 It was really delicious though. Re honey, I would just taste it. This is a big honey-producing area on a small scale i.e. lots of people with just a few hives, and stallholders on the markets are always happy to let you taste it. I love these local honeys. Most are quite strongly flavoured (rosemary, chestnut, garrigue …) because the plants are resinous and/or strongly scented. Acacia tends to be my “go-to honey” when I want something mild that doesn’t overwhelm other ingredients. I think clover honey would serve the same purpose. Mesquite sounds as if it would be strong, but you never know till you try it! Olive oil on the other hand — I normally buy large cans of Spanish oil, but it’s very strong and peppery. I used some mild, fruity French olive oil from Provence for this mousse. I’ll try a cake with it next!